Design-Nation were looking for a designer to create a planting plan which would complement Katy Holford’s sculptures and show off the form of Chris Eckersley’s planters. The design needed to be simple, enhance the different colours of the work on the stand and attract visitors to the stand without being the main attraction. 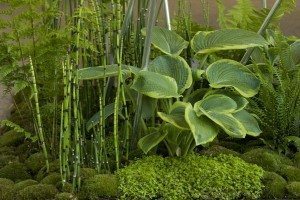 I chose plants which are predominantly British, have interesting architectural forms and are all luscious greens. Photograph by Ella Doran. The stand won a certificate of commendation from the RHS – equivalent to a silver gilt in the show gardens.